What is a Wire Grommet? The Wire Grommets protect cables when entering or exiting a system. The point at which a cable exits a connector body or other component can be a critical failure point. The wire grommets could be made from various materials, such as plastic, rubber or metal. 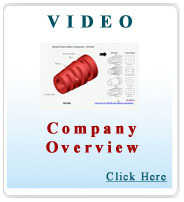 Our company is a One Stop Shop for plastic and rubber wire grommets and other cable management products. Over the years, we allocated considerable resources and expertize to supply the cabling industry and OEM markets with off-the-shelf and custom wire grommets and other cable management products. We can help you with grommet design (see our Online 3D Grommet Design Tool), grommet engineering, grommet manufacturing, mold tooling and production training. We also provide complete services - design, engineering and manufacturing for custom cable assemblies. Standard Wire grommets & other strain relief products are available with over 1,500,000 different configurations and could be provided to you at no mold tooling cost. Minimum order quantities are as low as 100pc for standard off the shelf parts, and 250pc minimum for custom molded products. or other cable management products.